Picnic weather. I'm a bit of a daydreamer and I often fantasise about picnics with a proper wicker hamper and lots of real, proper picnic home-made picnic food. In reality, however, our family picnics usually extend to cheese and ham sandwiches, homemade sausage rolls and hula hoops. Of course, there's nothing wrong with that. Just sometimes, a girl wants something a little different. But of course, I'm feeding Mr 'I know what I like and I like what I know' so doing anything too radical risks the divorce courts. And today's loaf was no exception. 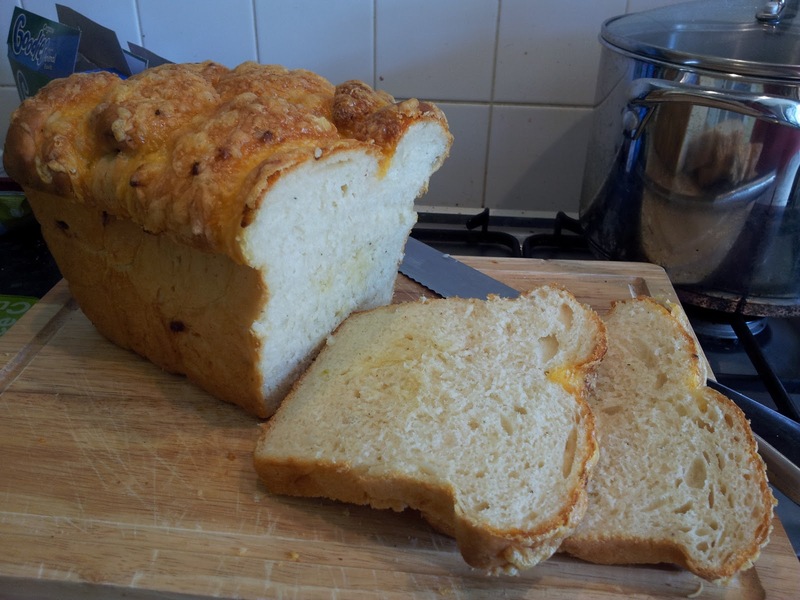 Just to rock the boat, I decided to do a ploughmans-style picnic with a cheese and onion loaf. Whilst I was sat enjoying the sun, thinking how lovely and cheesy and soft the bread was (I've never made a loaf that used milk before - I'm guessing that's what made the difference), the husband was busy complaining that the bread tasted weird. However he ate it - probably because he was a) hungry and b) sitting by a lake and didn't want to run the risk of getting wet. Highly recommended recipe from my Breads of the World book. Saute the onion with 25g of butter until caramelised. Cool. Mix the flour, salt, pepper, mustard, yeast, 125g of the cheese, and onion in a bowl. Make a well in the middle. Place in an oiled bowl and cover with oiled clingfilm and leave to rise for 1 hour or until doubled in size. Knock the dough back, knead lightly and divide into sixteen pieces, shaping each piece into a ball. Place half of the balls into the loaf tin. Brush with melted butter. Place the rest of the dough balls into the tin. Brush with the remaining butter then leave to rise until it reaches the top of the tin. Meanwhile, turn the oven on to 190C (170c fan). Once risen, top the loaf with the remaining cheese and bake for 30-35 minutes until golden.